Every girl at any age deserves to feel like a princess. 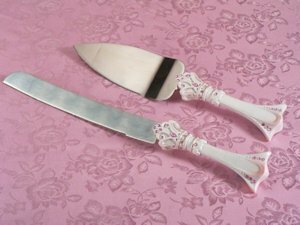 Help create an atmosphere of royalty with our Princess cake and knife server set. Each stainless steel server piece has a resin tiara shape accented handle and perfectly placed pink crystals - a perfect addition to your wedding or sweet 16 party. Set pieces are individually gift boxed and measure 10" long. Also search our site for the entire Princess Reception Set - which includes cake servers, toasting flutes, guest book and pen set.